Affirmative action has survived decades of conservative antagonism, an unfriendly Supreme Court, and attacks by Republican state legislatures, but the institution’s future looks bleaker than ever. While long a staple of the progressive agenda, race-conscious affirmative action has quickly been relegated to the relative fringes of the liberal platform. While both Hillary Clinton and Bernie Sanders are both supporters, it’s been a non-issue so far in the campaign. But while it’s been mostly missing from the national stage, the frame of the affirmative action debate has also shifted – the rise of Asian-Americans as the country’s anointed “model minority” has helped to disrupt the common understanding of affirmative action as an issue of black versus white. The question is whether Asian-American achievement – or rather understanding its underlying mechanisms – could hold the key to affirmative action 2.0. New research attempts to answer that question and highlight alternatives to race-conscious affirmative action. There are no easy answers, though, and with universities preferring to maintain statistical rankings rather than foster true diversity, it’s hard to find a practical example of affirmative action innovation. One thing’s for sure: If affirmative action is to continue to live up to its ideal, something needs to change. Justice Kennedy, the court’s swing vote, has been skeptical of affirmative action policies that consider race. “So far, he has not been willing to say that the Constitution will never allow you to consider race. That is what the four people to the right of him have said and want him to say,” says Sheryl Cashin, a Georgetown law professor and the author of Place Not Race. The court’s original ruling in 2013 was a forceful nudge for colleges to experiment with race-neutral affirmative action devices, but according to a survey released by the American Council on Education in July, only 13% of university administrators acknowledged doing so. In 2014, California’s attempt to revoke its longstanding affirmative action ban was scrapped when Asian-American activists mobilized in droves against the bill. Harvard continues to battle a lawsuit spearheaded by notorious conservative activist Edward Blum accusing the university of systematically discriminating against its Asian-American applicants. With its increasingly diverse population, California, unsurprisingly, has served as Ground Zero for the affirmative action debate. In California, “the fraught debate that has been part of the big conversation around affirmative action has very discouragingly really pitted some Asian-Americans against other Asian-Americans and communities of color writ large,” says Suman Raghunathan, Executive Director of South Asian Americans Leading Together, a social justice organization. When University of California, Riverside political science professor Karthick Ramakrishnan watched Asian-Americans revolt against SCA-5, an amendment to California’s state constitution that would have functionally revoked the state’s affirmative action ban, he had one question: Did these activists mirror the views of Asian-Americans as a whole? In October of 2014, Ramakrishnan surveyed Asian-Americans to finally gauge these perceptions. Using a question he says was modeled from previous polls by the Pew Research Center and Quinnipiac University, Ramakrishnan found broad support among Asian-Americans for affirmative action, perhaps bolstered by their consistently liberal political leanings. 68 percent of the Asian-Americans that Ramakrishnan polled supported affirmative action, ranging from as low as 63 percent of support among Chinese-Americans and as high as 73 percent among Indian-Americans. In an extended period of stagnating wages and downward mobility that has helped fuel the rise of Donald Trump, many Asian-Americans have been able to benefit from the American Dream. For Lee, support for race-conscious affirmative action isn’t just ideological: in June, she published The Asian American Achievement Paradox with Min Zhou, investigating exactly how Asian-Americans are so upwardly mobile. Culture has taken grip as a reductionist explainer of Asian-American success, but for all the talk of “Tiger Moms” and helicopter Asian parents, Lee and Zhou pinpoint highly-educated Asian immigrants as the foundation for how poorer Asian-Americans so easily override the deep disadvantages that accompany their socioeconomic status. Focusing specifically on Chinese and Vietnamese immigrants in the Los Angeles area, they discovered that many arrive in the U.S. as not only more highly educated than those who don’t immigrate, but also more highly educated than the American average. Wealthy Chinese and Vietnamese immigrants establish vibrant community institutions with resources that serve to clear a path for mobility among their less-affluent counterparts. With community organizations and programs like after-school tutoring, affluent Asian immigrants spread a frame of reference about achievement and success that permeates throughout the ethnic community. There is perhaps nothing more quintessentially American than the idea of meritocracy – that individuals should be rewarded simply on the grounds of their own virtue and ambition. America is so attractive to immigrants, my parents among them, precisely because it is perceived as meritocratic. At its core, what makes race-conscious affirmative action so unsettling is that it acknowledges the dirty truth that America, in practice, is anything but. What’s lost is the inevitable nuance that accompanies race and ethnicity. Not all Asian-Americans have the ability to overcome their poor backgrounds in the same fashion as Chinese and Vietnamese-Americans. Laotian and Hmong immigrants in America remain quite poor, lacking a class of affluent professionals that propel some other Asian groups. Many African immigrants, especially Nigerian-Americans, the nation’s most highly-educated immigrant group (more than 60% have bachelor degrees), in many ways resemble their Chinese counterparts. “Nigerian immigrants comes to America with extremely high levels of education, and people will often look at that group and say ‘race doesn’t matter’ if this black group can get ahead without thinking of where they started off in their quest to get ahead,” Lee adds. Could simply switching race to ethnicity fix the most egregious failures of affirmative action? It’s an enticing (if far-fetched) proposal. But forcing colleges to consider the sociological context of achievement among students of various ethnicities would almost certainly produce more meritocratic results than a system based on race alone. It’s poor and minority students that disproportionately lack access to test prep, which has itself become a billion dollar industry. “I think these kind of strategies are more likely to help create diversity in a sustainable way that’s completely insulated from legal attack, but also more likely to have political support,” Cashin says. Whatever the alternative, colleges can’t be given the easy way out: fostering racial diversity without truly reckoning with the hardship that students must overcome before they arrive on campus. America is a pretty awful excuse for a meritocracy, but we’re kidding ourselves if we think that affirmative action is doing all that much to correct for its enduring failures. “What universities really have to be willing to do, and where I really take them for the task, is to stop allowing U.S. News and World Report dictate their policies to them,” Cashin says. 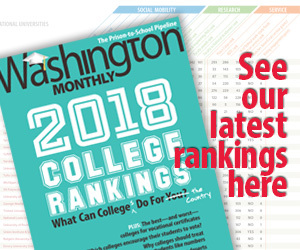 “If only they were willing to sacrifice their precious rankings a little bit, or stop letting the College Board dictate their policies to them. If only there were willing to innovate.” At least for now, it’s the primacy of that feared ranking that stops colleges from really experimenting in ways that could create a framework to fulfill affirmative action’s true potential.